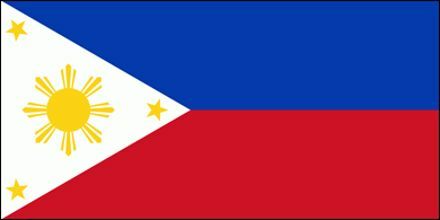 The National Flag of the Philippines, also called the Three Stars and a Sun. The blue stripe symbolizes patriotism and justice. The red represents valor and the blood spilt for freedom and independence and the white stands for peace and purity. The white triangle represents equality and the Katipunan nationalist organization. The three stars represent the three main geographical regions of the Philippines: Luzon, Mindanao and Visayas. The sun represents independence and its eight rays represent the eight provinces that led the Philippine uprising against Spanish rule.